DS 3 CROSSBACK is the luxury compact SUV, combining refinement and advanced technology. With its striking design, DS 3 CROSSBACK stands out as modern, sophisticated and elegant. 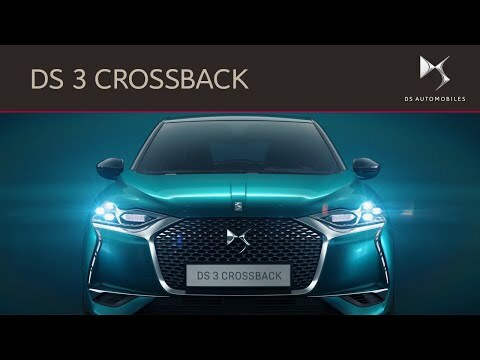 DS Automobiles writes a new chapter of its history with the new DS 3 CROSSBACK. Both a city car and a long-distance road car, DS 3 CROSSBACK fits perfectly into the second generation DS: new technologies and unequalled sophistication. You’ll be amazed by the deploying FLUSH FITTING DOOR HANDLES that only appear when you need them. The rest of the time they’re concealed, fitting neatly into the bodywork to enhance the sophisticated silhouette of your DS 3 CROSSBACK. Enjoy the pleasure of driving, while the intelligence of DS MATRIX LED VISION lights the way. DS MATRIX LED VISION headlights are the latest generation of smart lighting technology from DS Automobiles. As well as their aesthetic appeal, DS MATRIX LED VISION automatically adjust to the road ahead; when the road is clear, the full beam will be activated, dimming automatically when another car approaches. Immerse yourself in sophistication inside DS 3 CROSSBACK. We’ve paid close attention to the quality of the materials and finish of every detail. Beneath the touchscreen, the central fascia is spectacularly stylish. Echoing our brand emblem, the touch controls and two central air vents take the shape of diamonds. A celebration of Parisian luxury, DS 3 CROSSBACK’s interior remains faithful to the DS style philosophy: personalisation. Choose your interior ambiance from five DS Inspirations, each with its own distinct character. Advanced technology and a high driving position mean you'll be able to concentrate on the joy of driving. DS 3 CROSSBACK features a completely digital cockpit, designed to make driving information instantly available and controls directly at your fingertips.